These 4 photos are from "Linda" in Ontario, Canada. She has no blog, but I know she surfs many quilty blogs. I will encourage her to read the comments you leave as her quilting and piecing style is unique, as well as her clever backs. I believe the first two photos go together (backs and front) as well as the last two photos. Aren't they just fun, happy, cheerful, and full of pleasure and joy? Thank you, Linda, for these photos. I just love them, and am sure others will be inspired from your lovely quilts. If I'm remembering correctly, they are hand quilted. They are lovely -- and the backs, too! I especially like that second backing -- really fun! Well done Linda---they are very nice! I love it when the backs and fronts are "tied" together in some way! They are both beautiful! Thanks for sharing them. 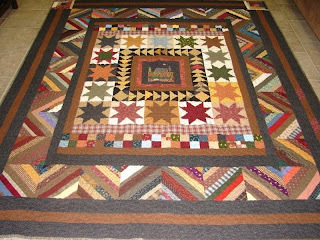 Linda's quilts are fabulous- I really do like the color combinations- very fun and bright- They will look great in lots of different rooms. Whoever owns them will be very fortunate indeed. Perhaps one day Linda you may decide to take up blogging- it really is alot of fun and there are lots of people out there who are willing to help. Thanks Elaine for sharing Linda's lovely quilts. Wow, how beautiful!! Thanks for sharing. I love her quilts and I adore the backs! I am inspired to do even more inventive stuff with mine. Thanks for showing us the lovely pictures. Love love love her work!! Please tell her thank you for sharing!! Fun backs, and the quilts are beautiful, too. Great job on both quilts. Keep up the good work. hey are "Beautimous" as my sister would say. I particularly love that first "back". 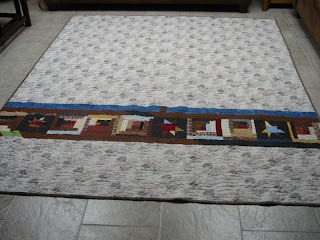 With some great quilting, it would make a wonderful art-quilt front! Great quilts and I love the pieced backs, esp the top one. Linda, you need a blog! I agree... these are nice and if Linda had a blog, we would all be going there to see what she is up to! Wow, I really like the backs of these quilts. Oh my, what delightful quilts and interesting QUILT BACKS. Inspirational, isn't it? Thanks for sharing her with us Elaine. How does she do it with those backs. By the time I get my quilt together the last thing I want to do is A QUILT BACK. What a nice person to know that can do this. Loved both of the quilt tops and the backs! Beautiful work! 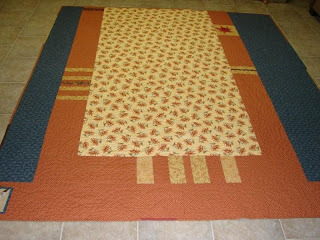 I love, love, love scrappy quilts and innovative layouts and love fun pieced backs even more! These quilts are great and would grace any bed, couch or quilt cupboard. Great work Linda! Absolutely lovely - fronts and backs. Way to go, Linda.Elaine, thanks for sharing these beauties with us. 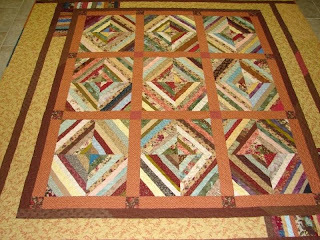 Love Linda's quilt with the string borders.